Shakshouka is a new dish in our house, but it is quickly becoming a favourite. It's apparently a very common breakfast in Israel, although I can't attest to that - as broke students traveling through the Middle East we found Israel so much more expensive than neighboring Syria, Egypt and Turkey, that we starved ourselves for the 3 days we were passing through. I remember one shared falafel, some fruit, and a small jar of peanut butter that raised a lot of suspicions at customs and delayed us for hours of scrutiny and questioning. Really, we should have ditched the peanut butter and found ourselves some Shaksuka. 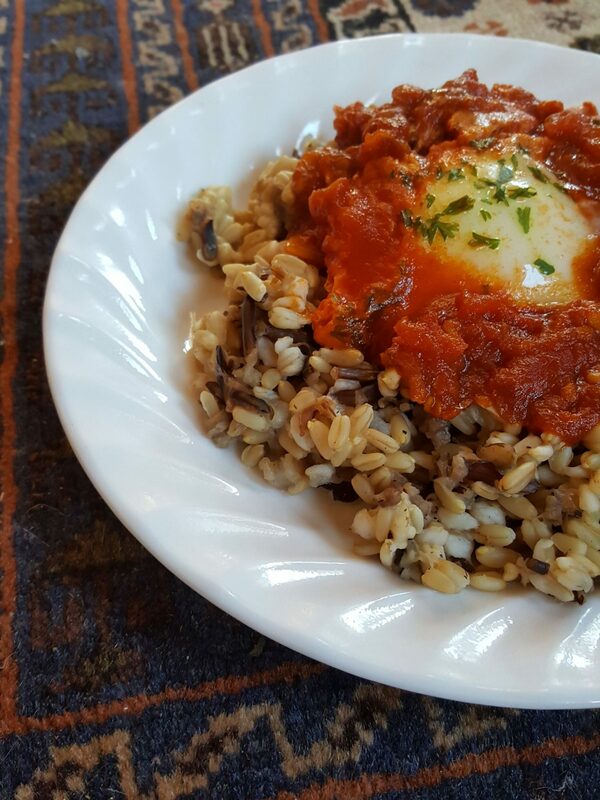 Essentially just eggs poached in a tomato sauce, this dish is traditionally served with bread to sop up the extra sauce, but we prefer it on a bed of rice, and the flavours work wonderfully with our "Naked & Wild Rice Blend." First things first: Bring 2 1/2 cups water to a boil. Add 1 cup Naked & Wild Rice Blend, reduce heat to a simmer, and cover with a lid. Simmer for 30 minutes. If some liquid remains, simply remove the lid and simmer for an additional 5 minutes. For the Shakshuka: Sautee your diced onion and minced garlic in a pan, adding diced peppers somewhere along the way. When the onions are soft, add the tomatoes and paste, along with all spices and add salt & pepper to taste. When the sauce ingredients have gotten to know each other a bit, crack 6 eggs into the pan, right on top of the sauce. Cover with a lid and continue cooking for 5-8 minutes, or until the egg is fully cooked, still soft but not runny. Sprinkle another dash of paprika over the eggs, and toss on some parsley or cilantro before serving on a bed of Naked & Wild Rice.